Frank Mora, LACC director and deputy assistant secretary of defense for Western Hemisphere affairs under President Barack Obama, and Juan Cruz, special assistant to President Donald J. Trump and senior director for Western Hemisphere affairs. The crisis in Venezuela. Oppression in Cuba. Russia’s and China’s influence on Latin America. There’s a lot going on in the Western Hemisphere. To analyze these pressing topics and explore U.S. policy toward Latin America and the Caribbean, the Jack D. Gordon Institute for Public Policy and the Kimberly Green Latin American and Caribbean Center (LACC) – both housed within the Steven J. 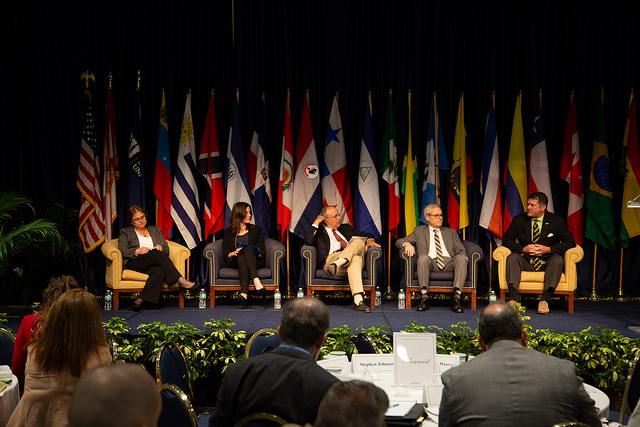 Green School of International and Public Affairs – recently hosted the third annual Hemispheric Security Conference. The event featured some of the leading minds on hemispheric security and included keynote addresses by Juan Cruz, special assistant to President Donald J. Trump and senior director for Western Hemisphere affairs, and Pete Marocco, deputy assistant secretary of state, Bureau of Conflict and Stabilization Operations at the U.S. Department of State. Another highlight of the event: four former deputy assistant secretaries of defense for Western Hemisphere affairs (DASD) – all of whom served under different administrations – came together for what has been dubbed by many a historic panel, to discuss change and continuity in U.S. policy. Here are five key take-aways from the conference, which was co-hosted by the U.S. Army War College. If there’s a problem in the hemisphere, the U.S. cares – and is ready to collaborate with its neighbors to combat corruption and oppression. That sentiment was echoed throughout conference, with many speakers discussing how, whether it be a natural disaster affecting a region or drug cartels infecting the hemispheric economy, a problem – or a success – in one region impacts the entire hemisphere. Cruz said that the Latin American and Caribbean region has seen incredible democratic and economic growth since the mid-1980s, but there are still some areas of concern. “We are confronting repressive regimes, removing violent gangs [and] strengthening our partnerships across the hemisphere,” he said. From left to right: Moderator Marisa Bras, Chief of Theater Analysis Division at United States Southern Command with four former deputy assistant secretaries for Western Hemisphere affairs: Rebecca Bill Chavez and Frank Mora, who both served under President Barack Obama; and Stephen Johnson and Roger Pardo-Maurer, who both served under President George W. Bush. U.S. security policy toward Latin America and the Caribbean hasn’t changed much throughout the years. Many people worry that party lines and individual leadership styles in Washington may affect the country’s security policies. The reality is quite the opposite. “There’s been a lot more continuity than change,” said Frank Mora, LACC director and deputy assistant secretary of defense for Western Hemisphere affairs under President Barack Obama. The situation in Venezuela sparked intense debate, with some speakers suggesting the military play a role in the transition while others warned about the dangers and upheaval a military-led transition could cause. Cruz said change in Venezuela’s government has often come about through military involvement and did not dismiss the possibility that, among other scenarios, the Venezuelan military could bring about an end to the Maduro regime. 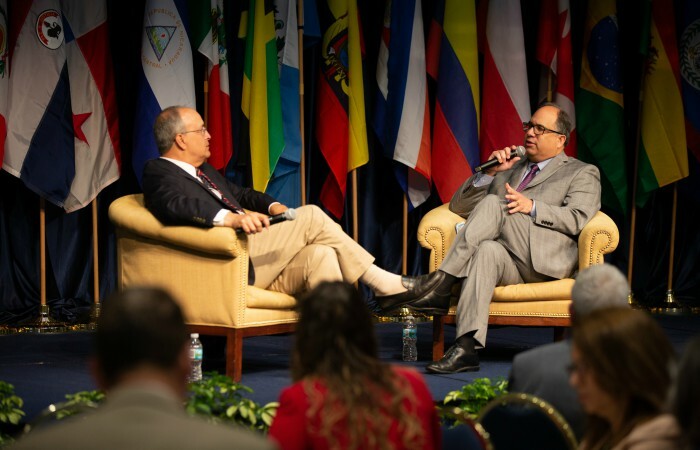 Roger Pardo-Maurer, deputy assistant secretary of defense for Western Hemisphere affairs under President George W. Bush, said that if the military does not lead the transition, the Venezuelan people might. And the U.S. must be prepared to help if that happens, he said. Mora, however, cautioned against a coup. Russia and China influence Latin America – and that affects us more than we think. He noted that Russian media is increasingly being shared through Latin American and Caribbean online and print media outlets – and challenging the region’s views about the U.S. Likewise, China’s influence on the region is significant, panelists noted. Enrique Dussel Peters, a professor at the Universidad Nacional Autonomia de Mexico, said that on average, China has been investing $11 billion U.S. dollars in Latin America and its influence has reached as far as the Venezuelan military. The U.S. remains committed to hemispheric prosperity – and has created a new framework to help guide its strategies. Marocco shed light on the work of the U.S. Bureau of Conflict and Stabilization Operations (CSO.) The bureau’s mission is to help U.S. diplomats prevent, respond to and recover from conflict that disrupts and undermines long-term development. “Not every conflict warrants U.S. intervention,” he explained. But, conflicts that can impact immigration, terrorism and have other large-scale consequences for the hemisphere call for strategic engagement, he said. The fourth annual hemispheric security conference will take place next spring. To learn more about the conference, click here.